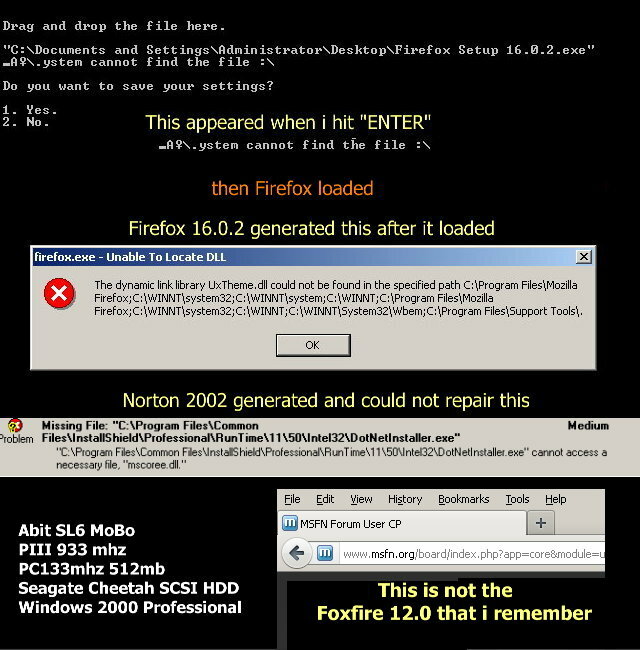 I came from the Roll up page link > to > here if i had any issues with the roll ups and loading Firefox Setup 16.0.2 into Windows 2000 Professional. Firefox Setup 16.0.2 loads fine , but when it tries to boot itself up it crashes or fails and creates the Log File shown in the picture i posted. Even after i restart the computer. When i pull everything out and load Firefox Setup 12.0 back in it works fine, however it seems that Firefox Setup 16.0.2 leaves behind it`s GUI shell and merges with Firefox 12.0. The same File logs are created loading onto Firefox 12.0 and without it.installed , and so i`m confused and not sure what is going on ? one last comment on the Application Compatibility Launcher ,as far as saving files 1.Yes. or 2. No. i`m not so sure as how critical of what it needs , but i do not know how to do that? I just typed in an " N and enter" I`m learning as i go. The other thing that i noticed was when i open any existing Word pad files that there is a lot of hex writing on them above and below what i already had on there, fortunately i am sitting on a fresh fdisk, format and boot without anything but Win2K , bare bones. Thanks-in advance for all your help!! Even though setup runs in the DOS console, it is still a windows app. In any case, it's looking for UXTHEME.DLL, which is not part of win2k. The win2k version of this might get around problems here. Compatibility mode just changes some answers that the OS provides the application, it does not add files that are not there. Alternatively you can just install the newest daily version of UURollup-v11 and then everything should work out of the box. Thanks for the help. I downloaded from Dropbox , (daily) Windows2000-UURollup-v11-d20130616-x86-ENU.7z. I believe it is a completed download 44.7mb , however when i try to run it, a box opens asking for for an application to run it with or rather to open it with, it will not run on its own. The .7z file has been compressed in the 7-Zip format. You need a program that understands the .7z format in order to decompress it. 7-Zip is a free program that can do that for you, but there are others. Thank -you bphlpt, , i was looking right at the file extension and it did not even register...duh....my bad. I un-zipped the Dropbox download into a new file, however i am now lost as of how to execute and run the Rollup 11update ?? By the way, thank-you to everyone(s) hard work, long hours and endeavors to keep W2K running with the pack. I really like this system and want to continue to use it for some time to come. . I read the news and check my e-mails and am still running a dial-up 56k modem which is sufficient , however with what everyone has contributed , i can still run my old machines, endure the latest Flash graphics and still be comfortable and happy without breaking my household budget having to upgrade machines .!! In order to install UURollup-v11 daily just run "update\update.exe" after unpacking the archive. Thanks Tomasz86 , guess i`m sleep at the wheel here , to many long hours. I found it and ran it , loaded fine and when i booted my computer back up i got an error message before Administrator log-on loaded. ( Powered by Extended Kernel ) NICE! Q: Is there a specific sequential order that these Rollups need to be loaded? I am 'assuming" though it`s brother is always not far behind with trouble, that everything should load right in? 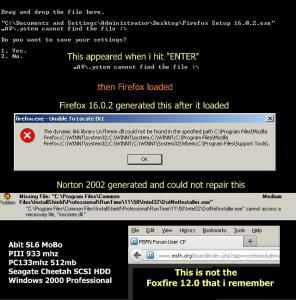 Ultimately i would like to get Firefox 16.0.2 loaded. and possibly Flash Player 11.2.202.235or greater? @NorthAzimuth I'm sorry your system got broken because of UURollup-v11 daily Actually I've encountered that problem a few times too while doing testing but haven't been able to find the culprit yet. It seems to be some other software to cause the critical error on boot. To be safe I'd suggest to try installing the daily release in a clean and fully updated system before everything else. Edit: The bug has been added to the Bug Tracker. UURollup-v11 itself requires at least Unofficial SP 5.1 (or official SP4 + Update Rollup 1) and unofficial Update Rollup 2. When using SP4+UR1 installing IE6 is not required but highly recommended. Of course it would be the best if ALL other updates were installed before applying the rollup but at the moment preparing a FULLY updated Windows 2000 installation is quite complicated. There are too many separate packages available and gathering all of them without getting confused is not an easy task. You can find my fully updated HFSLIP package in the Download Archive (go to Windows2000/UnofficialSP5/HFSLIP_ia.7z). It's intended to be used with HFSLIP but you can get an idea what kind of updates are necessary. It's 4 months old though so there may be a few updates missing including the newest release of UURollup-v11. I think it's time I regain interest in Windows 2000. It's been long, I'm on Vista now since it's very fast on this PC. But since your Rollups seem to be getting better, and the fact that I now have an nVidia GPU in my build, I'm reconsidering Windows 2000. But first, to get an old PS/2 KB to perform the install. Although this time, I hope that the weekly or daily is stable enough for use.